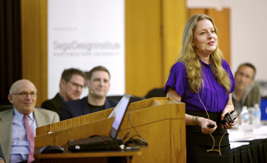 Entrepreneurs discussed the benefits of design thinking in the world place. Watch the Design:Chicago 2014 presentations. While great design is done by great designers, it is important for business leaders to be invested as well. The business leaders need to see the importance of design and foster creative thinking in the office. 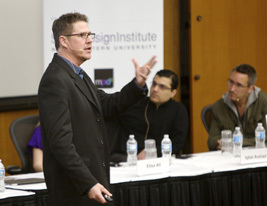 Gilboe (MPD ’07) was one of the panelists for this year’s Design:Chicago, which focused on the theme of “Designers as Intra/Entrepreneurs.” The James Allen Center’s McCormick Auditorium was packed on April 3 with an audience excited to see a panel of entrepreneurs from the design industry. Now in its seventh year, Design:Chicago brings together the Northwestern community, the public, and top designers and executives from the professional world to discuss topics and challenges in design. Gilboe leads an international, award-winning team of design experts in building innovative new products for consumers. He talked about the “quiet power of space” and how designers worked together to turn 3M’s drab cubicles into a colorful, open office space. Products are not the only things that can benefit from good design. Kristian Hammond, professor of electrical engineering and computer science, said communication should be approached as a design problem. Hammond is the cofounder and chief scientist of Narrative Science, a company that uses design to turn data into stories and insights. Narrative Science’s product Quill looks at data and transforms it into more understandable narrative descriptions. The problem with data, he said, is that few people can look at it and easily make sense of the numbers. Many companies now create visualizations to help individuals more easily understand data. However, even with visualizations, people are still forced to work hard to mine the underlying story. “Quill takes the data and gives not a story of the data, but a story of world with data as a source of the truth,” Hammond said. While Narrative Science is already serving many business clients to help them better understand financial reports, Hammond sees a more powerful use for Quill by applying it to individuals. One example is using Quill to help students make sense of standardized test results. 30Second Mobile developed from All’s website iParenting, which she sold to Disney in 2007. At the time, she recognized that mobile and social media were a growing trend but did not see other sites offering quick videos. Discovering a niche, she said, is a key to entrepreneurial success. Design thinking can lead to game-changing innovations and major breakthroughs, but, unfortunately, that does not mean it’s accepted everywhere. 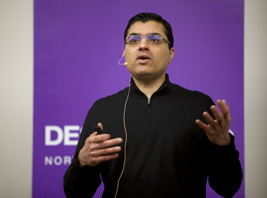 Iqbal Arshad (MEM ’97), senior vice president of engineering and global product development, at Motorola Mobility, warns that typical corporate structures encourage old-fashioned ways of thinking. Arshad said today’s companies often hire individuals to work in silos, which impedes collaboration on big ideas. He said entrepreneurs can work around this by inventing new business models that apply system-level design thinking. When leading the development of Motorola’s Moto X, Arshad said he continually asked himself how to make smart phones smarter. Rather than focusing on individual parts of the phone to improve, Arshad wanted to create a fundamentally different user experience. His team ended up creating a phone that follows voice directions without needing to be touched or even turned on. Scott Wilson, founder and chief creative officer of MINIMAL Inc., closed the evening by talking about his journey through the world of entrepreneurship. MINIMAL is an award-winning product development and brand incubation firm. It took Wilson several years and multiple failures before he found a company that was the right fit. 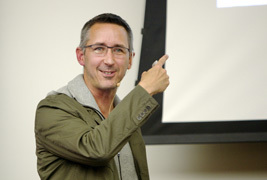 Wilson urged entrepreneurs in the audience to “activate superfans.” Wilson used Kickstarter to fund TikTok and LunaTik, which transform the iPod Nano into multi-touch watches. Having raised nearly $1 million in 30 days, it was one of the most successful crowd-funding stories in history. Inspired by the power of supporters, Wilson created the LUNATIK Rewards App that pays cash-based commission to TikTok and LunaTik users who spread the word about the products.